This picture taken on November 20, 2016 shows a mother Bryde's whale (left) and her calf feeding on anchovies in the Gulf of Thailand, off the coast of Samut Sakhon province. KimE12 Uploaded by KimE12 on Jan 16, 2017 . Brydes whales feeding - Desktop Nexus Animals Download free wallpapers and background images: Brydes whales feeding. Desktop Nexus Animals background ID 2215550. 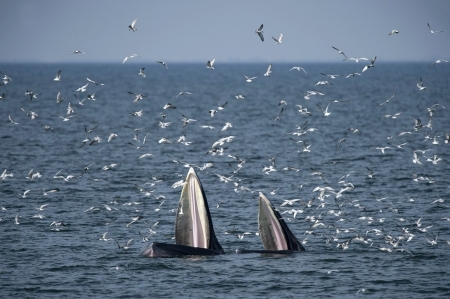 This picture taken on November 20, 2016 shows a mother Bryde's whale (left) and her calf feeding on anchovies in the Gulf of Thailand, off the coast of Samut Sakhon province.